Vegan Society of P.E.A.C.E. 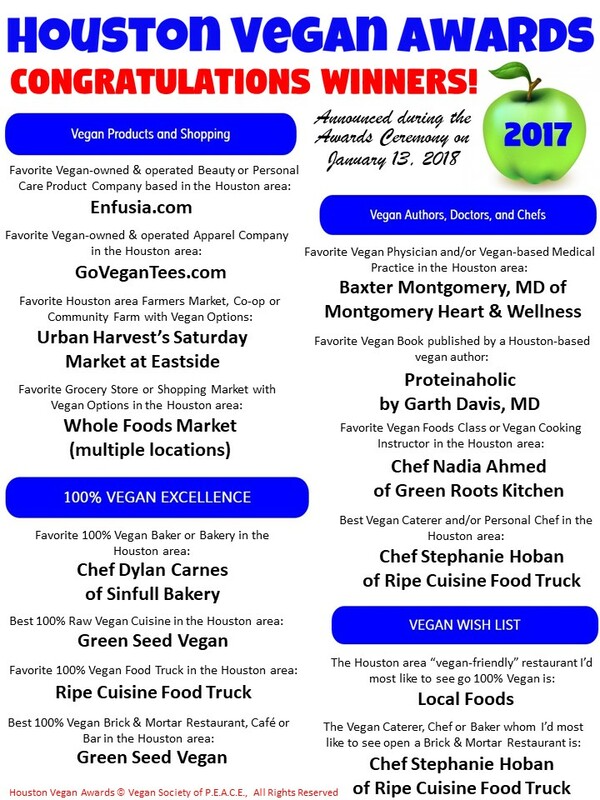 is pleased announce the Inaugural Houston Vegan Awards Winners for 2017! Winners were determined by community votes from the general public. Inspired by our annual "Hall of Fame" awards given during Vegan Thanks-Living events, the Houston Vegan Awards were created by our organization as a way to celebrate excellence in our local vegan community and to inspire a more vegan-friendly region here in the nation's 4th largest city. 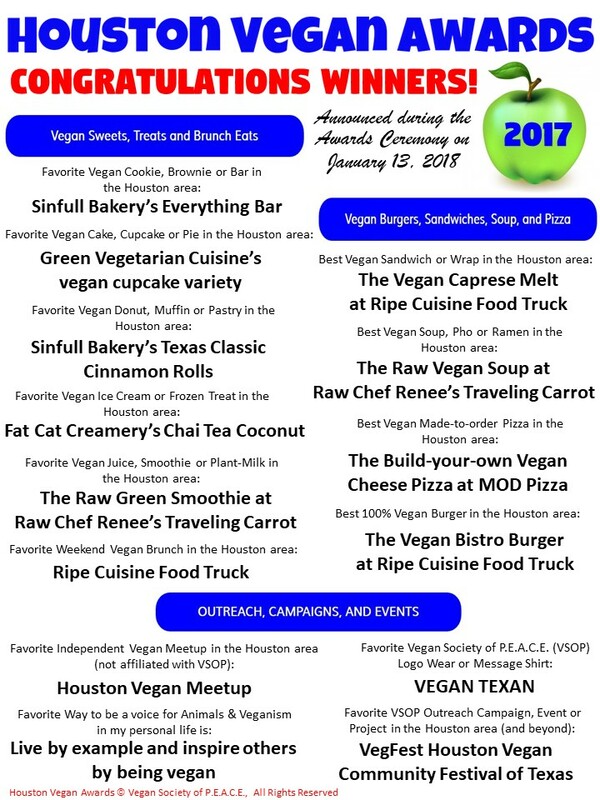 It's a way to give recognition to the amazing business owners and professionals who work hard to make the Houston area vegan-friendly. All category winners will be recognized by Vegan Society of P.E.A.C.E. at the January awards ceremony with a certificate, mentions on social media, and the obvious bragging rights which come with winning a specific category. CONGRATULATIONS! By definition, VEGAN means nothing derived from an animal. Vegan food does not contain any flesh or tissue, eggs, dairy, whey, casein, gelatin, shellac, excretions, honey, beeswax, or other animal-derived byproducts. Voting is once per person! Only one box can be selected per category. Nominees must be from the Greater Houston area and surrounding counties to be eligible. Write-ins are welcome. Several categories have a write-in option under "Other." To be eligible for the Prize Package, entrants must fill in name, email, and phone number at the end of the survey. Vegan Society of P.E.A.C.E. (VSOP) neither endorses any nominee appearing in the Houston Vegan Awards survey nor vouches for their business practices. The Houston Vegan Awards is solely a platform for determining and making public a variety of opinions --expressed in the form of awards-- relating to these nominees. © Houston Vegan Awards is Copyright Vegan Society of P.E.A.C.E. All Rights Reserved.